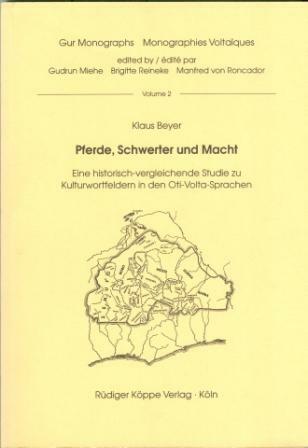 The present book on cultural semantic fields in the Oti-Volta languages is placed in the tradition of comparative and historical africanistics, bordering on the neighbouring disciplines of ethnology and history. Starting with a comparative analysis of selected cultural semantic fields, this work aims at proposing a relative chronology of the development of the lexicon and to phases of cultural development. Thus, this study operates on the assumption that the formation and development of cultural vocabulary to a certain extend reflects the cultural history of the speakers of a given language and can be used for ethno-historical argumentation. It is also concerned with the question of how far linguistic analysis is actually able to trace cultural developments. The geographical background to this study is the upper Volta basin, the Atakora mountains of Northern Benin and Northern Togo, and the Gambaga plateau in Northern Ghana. This being a relatively isolated region, the various languages and cultures of the different ethnic groups developed continuously without extreme external influence. Thus, on the one hand, foreign influence on the languages dealt with is easier to detect and to chronologize, on the other hand the development of the various subsystems of the languages, for example the lexicon, is better understood. The study consists of three parts. The first part explains the methodological framework on which the analysis is based. The second part gives an overview of the state of the art of the three relevant disciplines africanistics, ethnology, and history in respect of the languages and ethnic groups of the region studied here. The third part finally comprises the description and analysis of the cultural semantic fields. The book is concluded by an appendix including indices of languages, countries and speakers, the individual semantic fields, a genealogical tree, and maps of languages and divisions of selected lexemes. Die Einschränkungen vermindern jedoch nicht den positiven Gesamteindruck dieser groß angelegten Studie, deren Stärke besonders in der Lehnwortanalyse in den Königreichen im westlichen Oti-Volta und in der Skizzierung der Staatengründer zutage treten. Darüber hinaus offenbart der Autor zu zahlreichen kulturellen, historischen und linguistischen Aspekten profunde Sach- und Gebietskenntnisse, die dem Leser einen interdisziplinär gut fundierten Einblick in das Untersuchungsgebiet geben. Pferde, Schwerter und Macht ist eine informative und lesenswerte Studie in zweierlei Hinsicht: Zum einen zeigt Beyer die Möglichkeiten eines afrikanistisch-linguistischen Beitrags von Wortfeldanalysen zu einem interdisziplinären Erkenntnisinteresse auf. Zum anderen diskutiert er sorgfältig die dazu notwendigen Voraussetzungen und Einschränkungen, unter denen dies möglich ist, und markiert damit auch die diesbezüglichen Grenzen. Durch die geglückte Verbindung von Sprach- und Kulturgeschichte ist diese Arbeit für historisch-vergleichende Sprachwissenschaftler, Ethnologen und Historiker, die sich mit der Geschichte des oberen Voltabeckens befassen, gleichermaßen von Interesse. Ein Anhang mit einem Verzeichnis der Sprach-, Länder- und Sprechernamen, der einzelnen analysierten Wortfelder, einer Stammbaumgraphik und Sprachenkarte sowie Verteilungskarten ausgewählter Lexeme machen es dem Leser etwas leichter, sich bei der Fülle von Namen und Bezeichnungen zurechtzufinden.